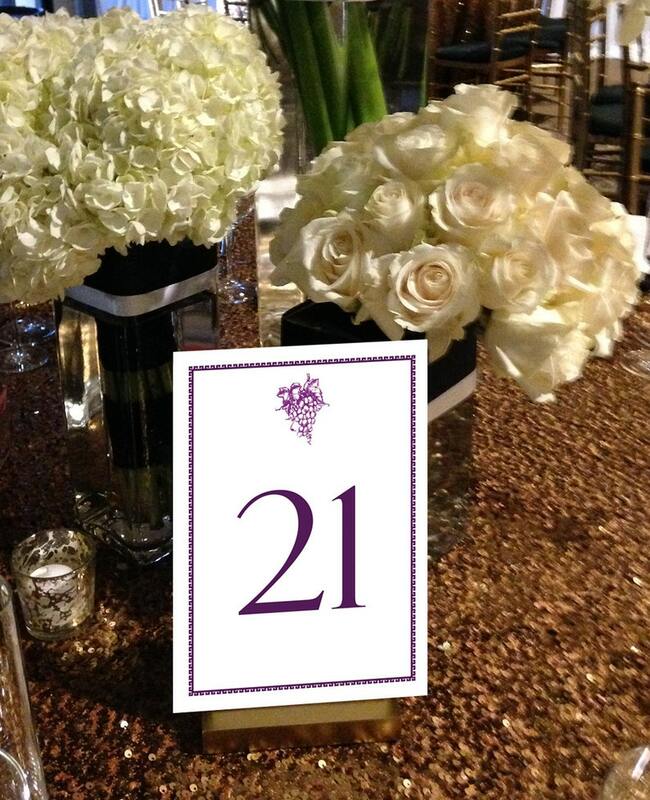 Add a romantic touch to your special day with these Grape Bunch Table Numbers, Winery Table Numbers, Napa Wedding Table Numbers, Wine Country Wedding Table Numbers 1 - 50 Instant Download Table Numbers. Great for the DIY bride or party planner looking for stylish wedding decor! ▶ Colors: Purple ink for the design, number and border. ♥ LOVE THIS DESIGN BUT WANT A DIFFERENT COLOR? With this design you can change the design, border and number colors. Purchase our Table Number Color Change listing https://www.etsy.com/listing/236429260/color-change-for-table-numbers? and pick a color from our color chart. 2 table cards per 8.5" x 11" page that can be cut to 4" x 6", 5" x 7" or half page 5.5" x 8.5"
Each PDF contains 25 pages, having 2 cards per page for a total of 50 table numbers. See printing tips and paper recommendations below. Available as an INSTANT DOWNLOAD once payment is confirmed, delivered exactly as described in this listing. No physical item will be shipped as this is a digital purchase. ♥ Place in a frame or special holder and enjoy! Please note that colors may vary depending upon monitor calibration, the settings of the printer being used, and card stock quality. Your purchase grants you a personal-use-only copyright release to print at home or at your local print shop. You may not resell this item. Awesome service! Quick turnaround and just what I needed! Used this menu for a baby shower! It was a hit!!! Striped Menu, Black and White Menu, Gold, Black and White Menu for your Wedding, Party or Special Event - finished size 4.25" x 9"
We accept Etsy approved credit cards. We try to have a fast turn around but times do vary based on the volume of orders we are currently working on. Once you have okay-ed the proof, the order can not be changed or canceled. All of our work are custom items and can not be used for someone else. Because of this, it is your responsibility to review the proof we email you and request any changes you would like to make. We are sorry but we cannot accept returns for items that you have ordered. THE MINIMUM QUANTITY: If you are ordering invitations, we can not print less than the minimum stated for each invitation style. Should you not need the minimum listed, we can still process your order, but note you will be invoiced for the minimum - we are sorry, there are no exceptions. We want to help you have the wedding of your dreams! Please contact us with any problems you have with your order so we can work with you to find the best solution. For Seating Charts, we work from your list. Please remove any people who are not attending. We only want the attending guests on your list to us in the order you want them to appear and do not include extra details such as what they will eat or their addresses. Generally the head table is not listed on a seating chart which gives you extra room for larger print.